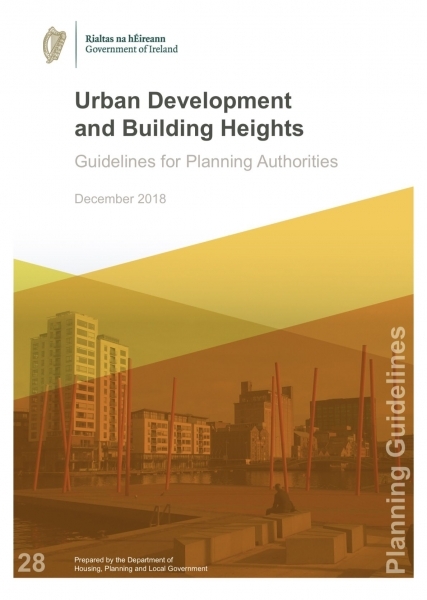 The Government’s ‘Urban Development and Building Height’ Guidelines have now been formally in place for over a week and, as we move into 2019, it is worth reflecting on the extent of change that we have seen in the planning policy context this year, and what it means for planning and development in the year ahead. The Height Guidelines have, of course, been in the public domain in one form or another for some time. Their final publication this month, however, adds to the momentum generated behind national policy objectives with the publication of the National Planning Framework in February and, more recently, the Draft Regional Spatial and Economic Strategies. With An Bord Pleanála’s decision- making under the SHD process leaving no doubt that national guidelines in areas such as residential density must be adhered to, and the Office of the Planning Regulator now enshrined in legislation, the scope for local variances in approach on strategic policy matters appears to be rapidly diminishing. The ‘Guidelines’ part of the title is, in the case of the Building Heights document, something of a misnomer. The document introduces a number of ‘Specific Planning Policy Requirements’ (SPPRs) for local authorities to abide by, and all local plans will have to be reviewed to ensure compliance with the Guidelines. We are therefore about to enter an intensive period of local plan reviews throughout the country in response to national policy. The ‘Guidelines’ are not being presented to local authorities to ‘opt in or out of’ as they deem appropriate. They are, in reality, part of an overall policy direction that will shape plan-making and development management for years come. The Guidelines further emphasise the national focus on ‘Compact Growth’. This guiding principle is fundamental to the National Planning Framework and the emerging Regional Spatial and Economic Strategies. When considered alongside the population projections and spatial hierarchies on which the emerging Regional Strategies are based, there is a greater imperative than ever for planning authorities to support increased height and density on appropriately located sites. With all planning authorities having to review their local plans to ensure consistency with the new Guidelines we are about to enter a major period of development plan review around the country. Local plans will need to remove any general policy content that may impose a numerical limitation on building heights and will have to identify specific locations where increased building height will be a requirement. This will apply to adopted SDZ Planning Schemes as well as County Development Plans, Local Area Plans, and so on. “It is Government policy that building heights must be generally increased in appropriate urban locations. There is therefore a presumption in favour of buildings of increased height in our town/city cores and in other urban locations with good public transport accessibility”. The Guidelines go on to set out guiding principles for local authorities to consider in assessing proposals for taller buildings. As part of this, they make it clear that local plan objectives that pre-date the Guidelines, and conflict with the ‘Compact Growth’ objective of the National Planning Framework, cannot be relied upon to overcome the Presumption in Favour. The criteria set out are all quite standard design considerations for anyone experienced in tall building development. Importantly however, the Guidelines note that where compliance with the criteria can be demonstrated, planning permission may be granted “even where specific objectives of the relevant development plan or local area plan may indicate otherwise”. The Height Guidelines, along with the NPF and the Regional Spatial and Economic Strategies that are being prepared at present, will clearly lead to a significant amount of development plan review activity during 2019 and beyond. This, of course, generates its own opportunities and threats for individual development interests and will most likely create resourcing pressures for the planning system in general. What is beyond any doubt, however, is the continued positive progression of the planning system in Ireland toward fostering a more compact and sustainable form of development, with increased building heights being a fundamental characteristic. This is, clearly, an optimal time to be advancing high density development proposals on well-located sites. By Ed Barrett, Director of Planning, Gravis Planning Ireland.